The saying, "If she can't see it, she can't be it," speaks to the importance of introducing girls to female role models, especially in areas where women's accomplishments were often overlooked or minimized such as in science, mathematics, and technology. 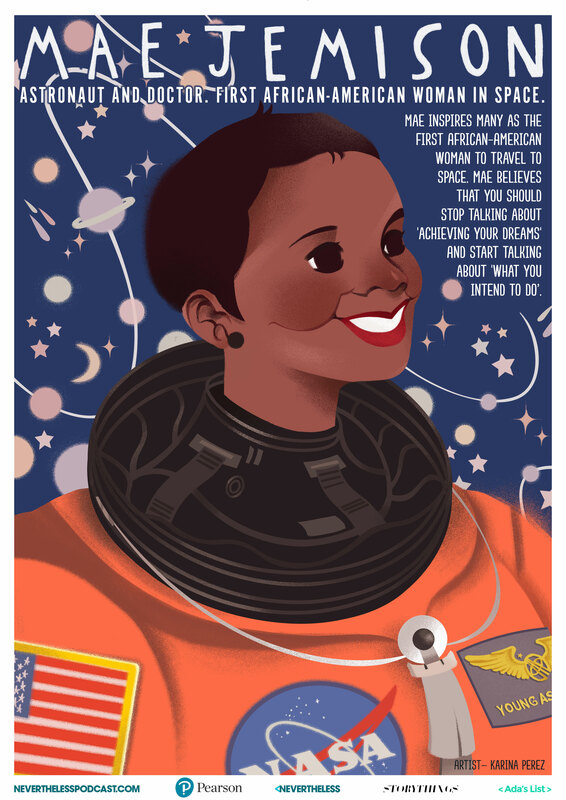 A new poster collection aims to bring more of these women's stories to light — and inspire today's Mighty Girls with the knowledge that she can be whatever she aspires to be! 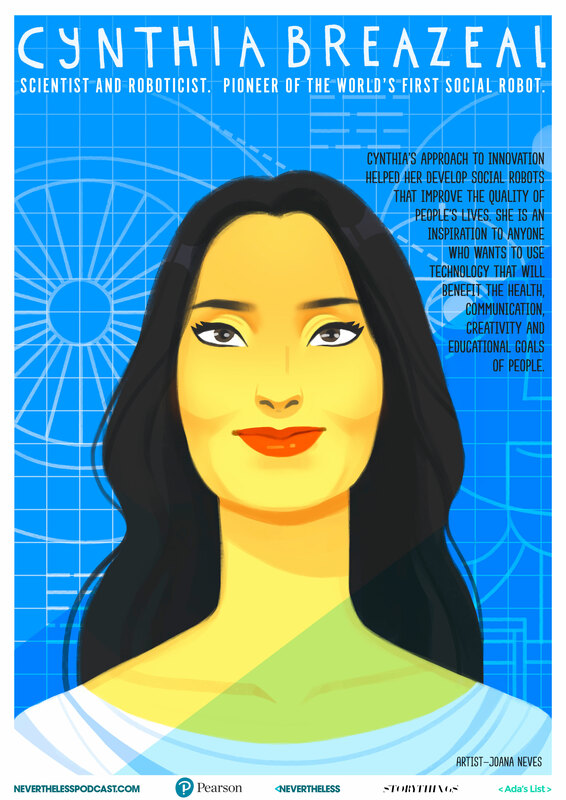 The free downloadable posters, created by Nevertheless, feature eight trailblazing women who have made an impact in STEM fields. Each poster is also uniquely designed by a different female artist from around the world. Nevertheless, a podcast which celebrates women transforming teaching and learning through technology, hopes that you will download the posters and print them out for your school, home, or workplace. 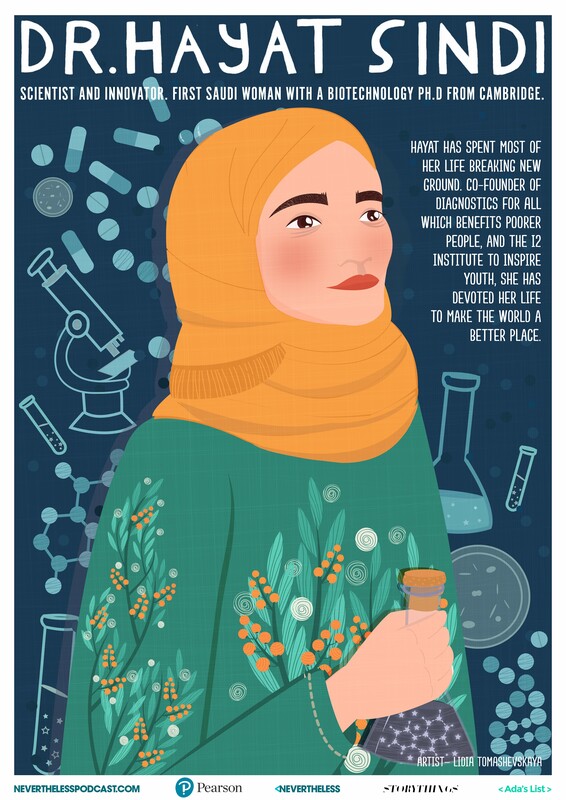 Below, you'll find links to download each poster, as well as a description of the scientist featured and recommended reading for both kids and adults to help you explore her story in more depth. Of course, one of the best ways to inspire kids is through stories, and there are fortunately an ever-growing number of high-quality books about female scientists, engineers, and mathematicians being written for children and teens! To learn about the the best new releases for all ages, visit our blog post, Ignite Her Curiosity: Books to Inspire Science-Loving Mighty Girls. The posters below are also available in seven other languages, through zipped folders that contain all eight posters in Brazilian Portuguese, French, French Canadian, German, Italian, Spanish, and Simplified Chinese. Dr. Cynthia Breazeal is an Associate Professor of Media Arts and Sciences at the Massachusetts Institute of Technology where she founded and directs the Personal Robots Group at the Media Lab. She is also founder and Chief Scientist of Jibo, Inc. She is a pioneer of Social Robotics and Human Robot Interaction. She authored the book Designing Sociable Robots, and she has published over 100 peer-reviewed articles in journals and conferences on the topics of Autonomous Robotics, Artificial Intelligence, Human Robot Interaction, and Robot Learning. Artist: Joana Neves is a digital artist from Portugal who loves drawing and started teaching herself how to digitally paint in 2014. She is driven by her longtime interest for fashion, folk tales, burlesque and animation. Resources: Readers ages 10 and up can learn more about Cynthia Breazeal's early work in Robo World: The Story of Robot Designer Cynthia Breazeal. 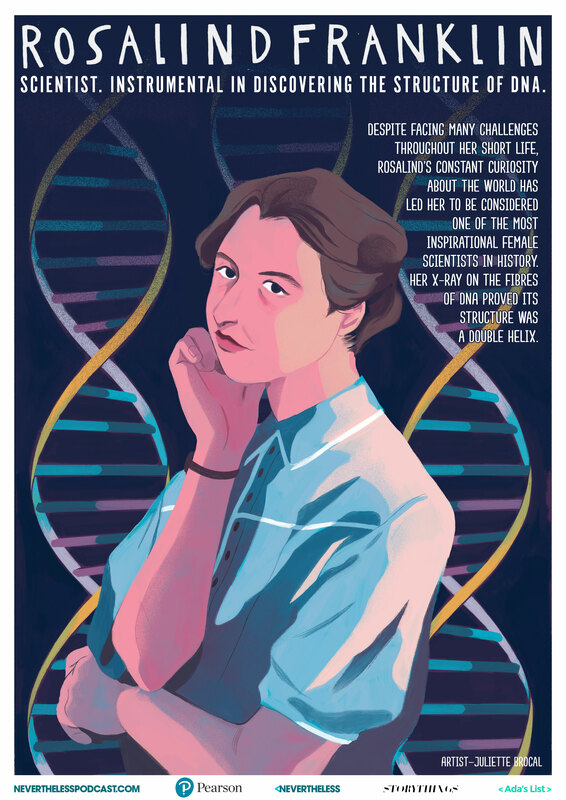 Rosalind Franklin was a pioneer of the study of molecular structures receiving recognition among scientists for her research on the molecular structure of coal, viruses, and DNA. Her X-ray diffraction images of DNA enabled the University of Cambridge’s Francis Crick and James Watson to identify the molecule’s double helix structure. For years her work on the structure went unnoticed as only Crick, Watson and Franklin’s colleague Maurice Wilkins received the Nobel Prize for the discovery in 1962. In 2003 The Royal Society established the Rosalind Franklin Award to bring attention to outstanding work of women in STEM. Artist: Juliette Brocal is an animation student & illustrator from France who likes to draw seaside places, folk stuff and people playing music. Resources: Rosalind Franklin is one of the inspiring scientists featured in Women in Science: 50 Fearless Pioneers Who Changed The World for ages 9 and up. Adult readers can learn more about her in the biography Rosalind Franklin: The Dark Lady of DNA. There is also an excellent NOVA episode about her, DNA: Secret of Photo 51. Mae C. Jemison is an American engineer, physician and NASA astronaut. She became the first African American woman to travel in space when she went into orbit aboard the Space Shuttle Endeavour on September 12, 1992. She resigned from NASA in 1993 to found a company researching the application of technology to daily life. She has appeared on television several times, including as an actress in an episode of Star Trek: The Next Generation. She is a dancer and holds nine honorary doctorates in science, engineering, letters, and the humanities. She is the current principal of the 100 Year Starship organization. Artist: Karina Perez is a Mexican American Illustrator/Designer. She’s always interested in exploring storytelling through design and color to visually communicate the love and acceptance she receives from those around her. Resources: You can introduce young readers to Mae Jemison's story in Mae Among The Stars for ages 4 to 8 and You Should Meet: Mae Jemison for ages 6 to 8. 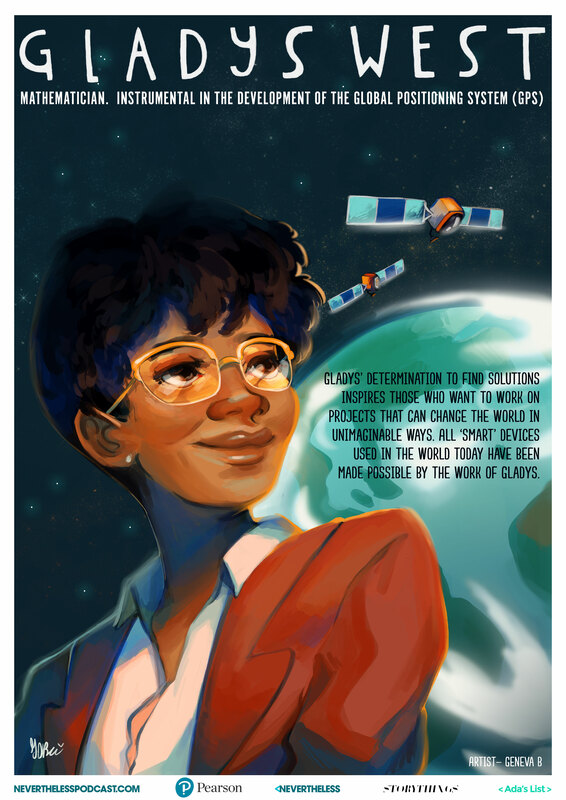 She also appears in Women in Science: 50 Fearless Pioneers Who Changed The World for ages 9 and up, and Women in Space: 23 Stories of First Flights, Scientific Missions, and Gravity-Breaking Adventures for ages 12 and up. Jemison is also one of the women of NASA featured in the LEGO Women of NASA Building Kit. Maria da Penha is a Brazilian biopharmacist and human rights defender. She advocates for women rights, particularly against domestic violence. When Maria da Penha was almost killed by her husband, there wasn’t a single police station she could go to in Brazil that specialized in violence against women. The case Maria filed languished in court for two decades, while her husband remained free. Years later, in a landmark ruling, the Court of Human Rights criticized the Brazilian government for not taking effective measures to prosecute and convict perpetrators of domestic violence. 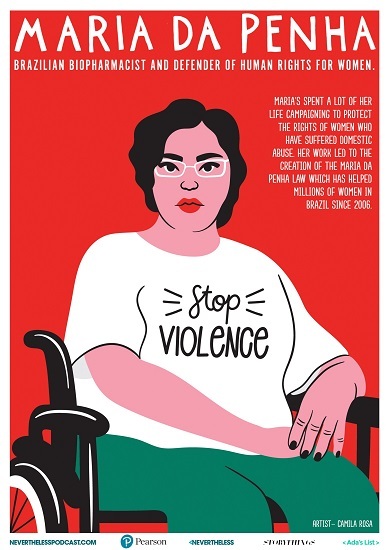 In response to this, the Brazilian government in 2006 enacted a law now known as the Maria da Penha Law on Domestic and Family Violence, which increased the severity of punishment for domestic violence against women, whenever it occurred in a domestic or family environment. Artist: Camila Rosa. Camila is a freelance illustrator and designer from Brazil. Her work translates women from an alternative perspective: Latin-American, brave, powerful, and not fitted to mainstream beauty standards. Camila believes it’s important that her work can be used to support and educate girls and women around the world. 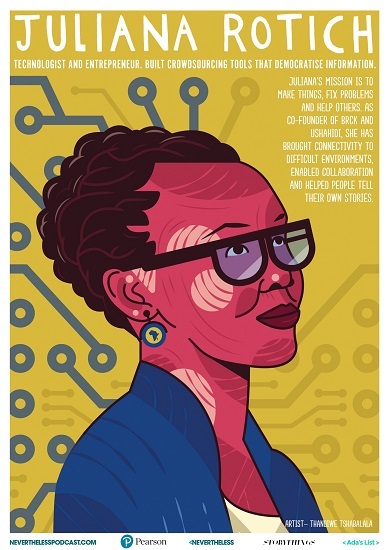 Juliana Rotich is a technologist, strategic advisor, entrepreneur, and keynote speaker. She is co-founder of BRCK Inc, a hardware and services technology company based in Kenya. BRCK was formed to realize a vision for enabling communication in low infrastructure environments by developing useful, innovative technologies. Juliana also co-founded Ushahidi Inc., a non-profit tech company, which specializes in developing free and open source software for changing how information flows in the world. Artist: Thandiwe Tshabalala. Thandiwe is a Cape Town-based graphic artist. Her work is bold, colorful, and conceptual. Her motto as a creative is: “Communicate don’t decorate.” In 2015 she was awarded with the prestigious Mbokodo Award for South African Women in the Arts, in the Creative Design category. Dr. Hayat Sindi was born in Makkah, Saudi Arabia and is one of the world’s leading biotechnologists. 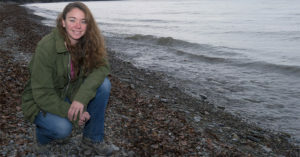 She is the Founder and President of the i2 Institute and a co-founder of Diagnostics For All. She was ranked by Arabian Business magazine as the 19th most influential Arab in the world and the ninth most influential Arab woman. Sindi has a Ph.D. in biotechnology from Newnham College, Cambridge, which she obtained in 2001; she was the first Saudi woman to be accepted at Cambridge University to study the field of biotechnology, and the first woman from any of the Arab States of the Persian Gulf to complete a doctoral degree in the field. Artist: Lidia Tomashevskaya is a freelance illustrator from Tel Aviv, Israel. She has worked with publishing houses on book illustrations and has produced illustrations and graphic design for brands such as Hewlett Packard. Tu Youyou is a Chinese pharmaceutical chemist and educator. 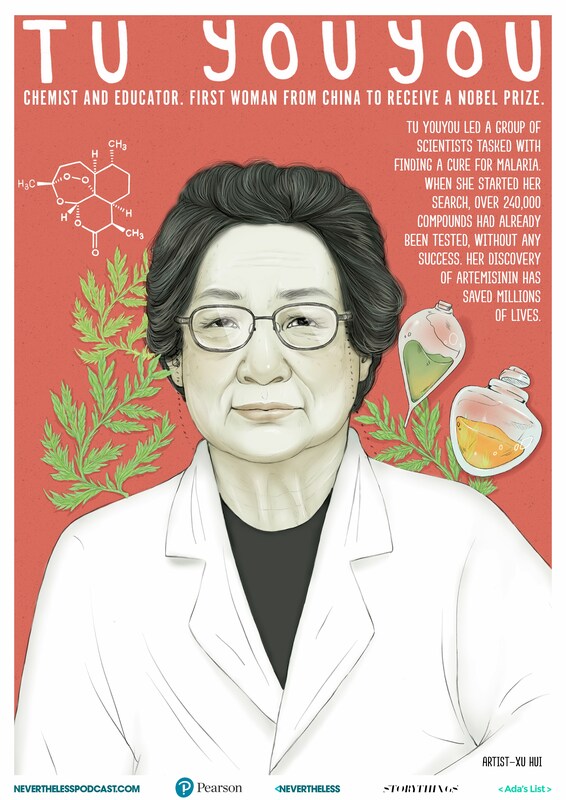 She discovered artemisinin (also known as qinghaosu) and dihydroartemisinin, drugs used to treat malaria. Her discovery was a significant breakthrough in 20th-century tropical medicine, saving millions of lives around the world. For her work, Tu received the 2011 Lasker Award in clinical medicine and the 2015 Nobel Prize in Physiology or Medicine, jointly with William C. Campbell and Satoshi Ōmura. She is the first Chinese Nobel Laureate in physiology or medicine, and the first female citizen of the People’s Republic of China to receive a Nobel Prize in any category. 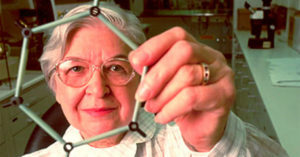 She is also the first Chinese person to receive the Lasker Award. Tu Youyou was born, educated and carried out her research exclusively in China. Artist: Xu Hui. Xu Hui is an illustrator from Jinan, China. Gladys West is an American mathematician known for her contributions to the mathematics underpinning GPS. Her contributions to GPS were only uncovered when a member of her sorority, Alpha Kappa Alpha, read a short biography West had submitted for an alumni function. Artist: Geneva B is a self-taught illustrator from North Carolina. She loves working with colors, drawing big hair, and adding whimsy with a touch of realism and happiness.